Submitted by Suilean Dubh on January 23, 2012 - 3:05am. Submitted by Chikasempai on January 23, 2012 - 3:23am. I thought our laundry light in our new house was sensor activated, turns out it's faulty wiring and totally coincidental that it comes on when I walk in the room. Submitted by Jam on January 23, 2012 - 12:32pm. Submitted by Fuseblower on January 23, 2012 - 3:52am. On the top floor of our house we have a shower room with a sink in it. But in order to get hot water into it it has to be pumped up from the floor below, because the hot water is gravity-fed. But how do you start the pump? Couldn't find an affordable source of those taps (aka faucets if you don't speak the Queen's English) with a sensor at the back when we installed this, so instead developed a small electronic system which is activated by a push-switch over the sink. Submitted by kriztov on January 23, 2012 - 3:54am. Could be worse, what if the switch was on the outside of the door? Submitted by Fuseblower on January 23, 2012 - 8:58am. Er, the main isolator for the power shower is! Submitted by vannet on January 23, 2012 - 5:09am. Submitted by Andrew on January 23, 2012 - 5:25am. The most annoying thing about motion detectors and lights is when the lights go out while you're in the bathroom. Submitted by Taolan8472 on January 23, 2012 - 6:41am. absolutely. 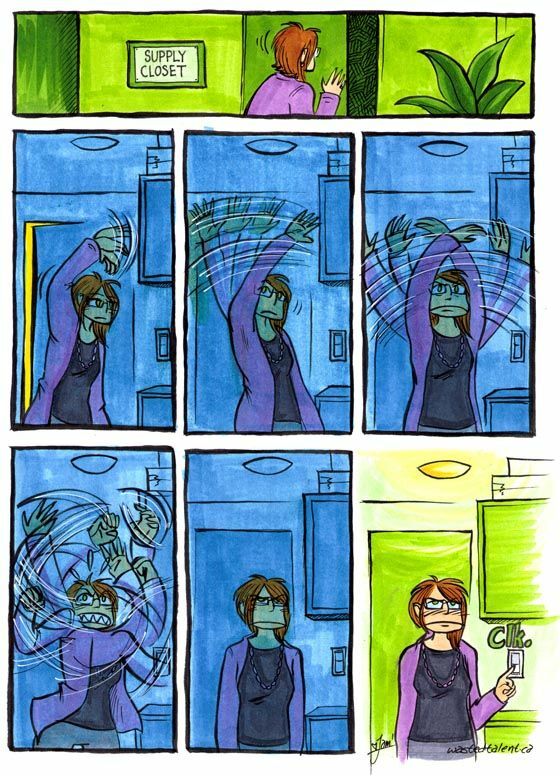 Wanna know something else annoying about motion sensors? While they normally won't pick up small things, like houseflies for example, they will pick up said small things if they land on the effing sensor. Like when I was on Active Duty for the Army at Ft. Drum, New York. I was the armorer, which basically means my work day consisted of maintaining all the weapons and other equipment (personally responsible for about 2.4 million dollars in assorted gear).... Well there's a motion sensor in the arms room. This motion sensor is calibrated to ignore little things like house flies. I got woke up in the middle of the night by the officer in charge of the arms room and the MPs knocking on my barracks room door. The sensor had gone off and I needed to open up the door. So I do. And there's nothing there. Just like I knew there wouldn't be. Then the gorram fly has the nerve to buzz me. You better bet I hunted down that little fracker with a vengeance. Submitted by Jam on January 23, 2012 - 12:34pm. Submitted by pgn674 on January 23, 2012 - 4:01pm. They installed motion sensors in our dorm rooms at college. Even if both me an my roommate were in the room, we could easily be still enough (especially when we were on our computers) that the lights would go off after a few minutes, and it would take several hand waves to get it to go back on. After a week of this, I finally pulled open the sensor, saw that it had only some numbered flip switches, found the manual online, and put it in permanent on mode and just used the wall switch instead. Then I told everyone in the dorm how to do the same thing themselves. Submitted by Nira on January 23, 2012 - 7:20am. A friend of mine has a motion sensor light between her house and garage, focused on the pavement between the 2. (She lives in the city with a small child, so security is important.) Once in a while I'll go over to let her dog out and, of course, the light pops on whenever we're out back, assuming you stand in the 2sqft that activates it, but as soon as you leave that one spot, and I mean AS SOON as you leave it, it shuts off. Submitted by Kisai on January 23, 2012 - 10:20am. Motion sensors are infrared sensors, they also waste energy. If you put an incandescent light in, you don't notice that the bulb is lit, ever-so-slightly, because the switch has to complete a circuit in order to operate. If you plug in a CFL, it will flicker like it has been plugged into a dimmer. Submitted by Loafer on January 23, 2012 - 11:16am. Love the hilariously cute flailing! Submitted by LogicMouse on January 23, 2012 - 12:16pm. It's odd. I didn't notice the title at first, and I read it as Jam waving her hand around looking for the chain. Because it's a closet. The only possible way to light a closet is with a bare bulb controlled by a chain hanging down from the socket to just out of your comfortable reach. Submitted by MelSkunk on January 23, 2012 - 1:08pm. Submitted by Jam on January 23, 2012 - 1:46pm. I find sinks require a series of awkward poses before I remember that faucets are a thing. However if they *do* have a sensor, I figured out that most of the ones used in bathrooms are LIGHT sensors not MOTION sensors, so if you just touch the sensor itself to block out the light that helps. At least I think. It might be a placebo. Submitted by Rashkavar on January 23, 2012 - 10:16pm. None of the ones in my area turn on when I cover them, so they're not light sensors (plus, there's a sign saying "please turn off the lights" on your way out in several places, making the light sensor concept a really poor choice). I find you have to hold your hands in just the right place and if you move them around to properly wash your hands, it just decides you're gone and turns off. One is particularly bad and I came very close to yelling "I'm right f***ing here, d***it!" before realizing how that would sound to anyone outside the men's room. Submitted by AmariT on January 23, 2012 - 2:49pm. Submitted by AckAckAck on January 25, 2012 - 12:23am. The problem with gesture and voice activated machinery is that they still not accurate enough to receive our commands. These machines are good for disabled person, but I still prefer the basic buttons/touch buttons. It was simple, easy to use and fool proof. This give me an idea, a sensor that will help blind folks finding their items. Let say there are sensors in every rooms that accept voice commands. When he/she looking for... say.... a hair dryer, simply say "(insert the name of your AI computer here), Find Hair Dryer" and said hair dryer, already equipped with a small sensor will emit a beeping voice that can be easily identified. Submitted by briarroot on January 25, 2012 - 5:21am. SUPPLIES! (couldn't resist) I read your comic first thing in the morning; didn't notice the title. Looked like you were reaching for a pull-switch; I often do just that. Submitted by bjmgeek on February 3, 2012 - 6:37am. I had a friend who used to always work late, and the motion sensor lights would turn off while he worked. His solution was to get an oscillating fan, which provided enough motion that the lights would stay on. Submitted by richardmayer on July 11, 2014 - 11:10pm. So frustrating that there are automatic mechanism that don't works despite that you have all the expectation of its functions and features. That may be from its system failure or any other faulty for it not to work, but there is always a second option, use the features manually. Like the experience I have, I bought a Victorian door at caldwells.com at Bay Area, San Francisco and use automatic opener and locking security. I have all both use automation and manual functions as optional if in case one don't work. Whew! That was a bit embarrassing, good thing no one was around to see th- oh wait.